The experience of handwriting development in the early years points to long-term consequences impacting the course of a child's future. Although often considered a trivial skill, neuroscientific research indicates that handwriting is an essential literacy tool required to learn and read faster. Children that understand letter formation with ease demonstrate greater retention capabilities. This edge provides a learning advantage in their reading competency, which allows them to become literate earlier in life. In May 1998, the International Reading Association (IRA) and the National Association for the Education Young Children (NAEYC) composed a joint position statement to provide a guideline for educators of young children. The IRA/NAEYC stated, "one of the best predictors of whether a child will function competently in school and go on to contribute actively in our increasingly literate society, is the level to which the child progresses in reading and writing" (p. 1). Learning to Read and Write: Developmentally Appropriate Practices for Young Children. Retrieved from https://www.naeyc.org/files/naeyc/file/positions/PSREAD98.PDF. 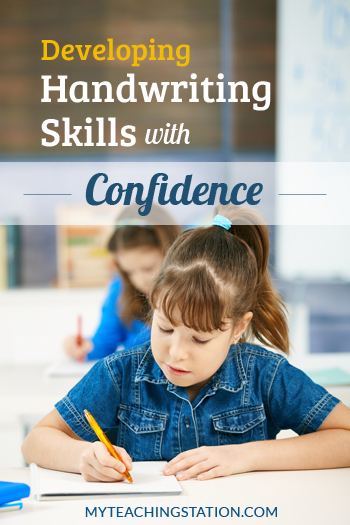 Among educators, the common question of which handwriting technique and style to employ for best results is a pressing topic. The two most popular methods for introducing letter formation in manuscript handwriting are the traditional "ball-and-stick" method and the "continuous stroke" method. In the traditional "ball-and-stick" teaching method, children often lift their pencil and move it to a new position for the second stroke to complete the letter formation. As an example, the letter b is taught by drawing a vertical line followed by lifting the pencil to draw a circle. As logical as this writing system may appear at first glance, a growing number of educators now understand the potential negative associations; complications may include the possible link to dyslexia. A growing number of letter reversals (where a child confuses the b with the d and the p with the q) has increased with the introduction of the "ball-and-stick" handwriting method. In contrast, the "continuous stroke" method allows the child to form a majority of letters without lifting the pencil. In this case, the b is taught by starting at the top line, creating a vertical stroke to the base line, and then moving up in a circular motion without lifting the pencil to complete the letter formation. By eliminating the need to lift and relocate the pencil for the majority of letter formations, the "continuous stroke" method proves superior in preventing confusion and letter reversal. Additionally, the "continuous stroke" method helps develop fluency and pressure motor skills, which are precursors for cursive writing. Furthermore, in applying this method, children also promote increased neuron connections in the brain for an overall improved learning experience. The early years of education are perhaps the most critical in developing literacy fundamentals that shape and influence a lifetime of learning. As with all teaching techniques, evaluation of a child's progress and response to instructional time is a priority; however, basing the learning experience in teaching methods best equipped for successful growth, positions a child to excel and thrive. Children desire to model adults and respond well to live examples. Expecting a child to advance in handwriting while only modeling the use of a computer keyboard, may create a lack of natural interest in the art of handwriting. Provide handwriting examples on paper, whiteboards, sand, and other creative surfaces allowing your child to engage in the demonstration. Use letter templates to ensure consistent formation and writing techniques. It is better to work slowly through a single letter at a time with correct formation then to move too quickly without retention. The size and legibility will improve through practice and familiarity. Use large movements to impress the letter concept and pattern, which allows your child to recognize the fundamental elements. Shape refinements will come gradually. Identifying letter formations in everyday objects of a child's natural environment helps promote and accelerate shape recognition. This practice develops recognition and familiarity from the child's point of view, which transfers to the discipline of handwriting. Allow sufficient time for letter impressions to solidify in your child's memory before introducing the reversible form. The child's ability to grasp letter concepts is critical to limit confusion and provides time for understanding the similarities and differences in letter formation. The letters a, c, d, g, q all begin with the same position and motion. By teaching these letters in progression, your child will recognize patterns. Laughter, animation, and movement are a child's learning language. Creatively inspire a desire to practice through fun activities and use of the imagination. Encourage your child using positive reinforcement on progress and help them identify needed corrections by comparing their handwriting with a correct letter formation template; this promotes critical thinking and cognitive reasoning. As educators, we often forget the process of time, practice and experience it has taken to reach a point in life. Stay focused on your child's retention capacity and carefully observe learning cues closely. Mastery comes through understanding and repetition. Use 10 to 15-minute incremental chunks of learning throughout the day and reward small steps of progress often. Do you have experience in teaching handwriting to children? Please share your thoughts below.